Adding your checks is a breeze. Simply set your applications to email your custom CheckCentral email address, set a couple of options and you’re good to go! CheckCentral never stops keeping tabs on your checks. When something is wrong, you’ll know instantly via SMS, email and mobile push notifications. Say goodbye to complicated filters & countless folders. With CheckCentral you can get back to using your email inbox for what it does best: handling actual email. 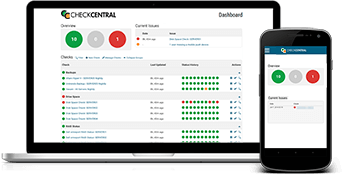 CheckCentral supports any application that can send email notifications, including backup software like Comet Backup, Veeam, ShadowProtect, Acronis, Altaro, and more! The best way to learn about CheckCentral is to try it for yourself! We’ve set up a live demo dashboard with several sample checks. Simply click on the Live Demo button below to get started! When you’re ready to create your own dashboard, click Sign Up.